Denis Condon’s blog Early Irish Cinema looks back at the early development of cinema in Ireland on the anniversaries of those developments and offers information on what cinemagoers could have seen in Irish cinemas a century ago. Here Denis looks at how cinema refashioned Irish public taste. Evening Telegraph, 23 Aug. 1915: 1. In its reviews of entertainments on Tuesday, 24 August 1915, Dublin’s Freeman’s Journal departed from the usual blandly favourable tone of newspaper notices to criticize the choice of film at the Bohemian Picture Theatre. Although the reviewer praised the “discrimination exercised by the management in the selection of films” since the picture house had opened the previous year, s/he regretted that the “inclusion of ‘Sapho’ this week introduces an unedifying subject” (“Bohemian”). Although the reviewer conceded that the film actually contained “very little to which exception might be taken,” s/he argued that “these experiments against the public taste are very dangerous, as might have been gathered from the attitude of the audience” (ibid). The reviewer neglected to say, however, what had been the audience actual reaction to Sapho. Others were a little more forthcoming. 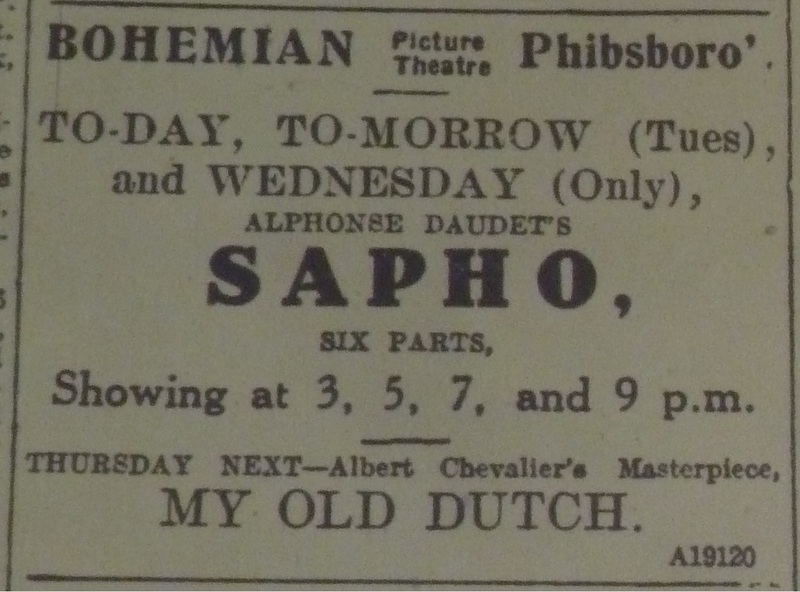 Attending the Bohemian’s 7pm show on Monday evening, Joseph Holloway thought that the “unpleasant love story of Jean & Sapho was well enacted – a crowded audience witnessed it & many were waiting outside to see the 9 o’clock show as I came out” (Holloway, 23 Aug. 1915). Holloway did not mention any manifestations of dangerous attitudes among this apparently enthusiastic audience, but a report in the trade journal Bioscope some weeks later perhaps accounts for the Freeman’s hints about agitation among the audience. “During the screening of ‘Sapho,’ at the Bohemian Theatre,” Paddy, the Bioscope’s Irish correspondent, claimed that “the Vigilance Committee – or what purported to be the same – held a massed meeting at the corner of the street, and also secured a brass band which did a few triumphal processions past the theatre” (Paddy). The Bohemian had been and would continue to be a target of Dublin Vigilance Committee (DVC) activity, but the use of a brass band was not repeated there. This may be because this tactic failed to attract the same level of publicity as the disturbance in the auditorium, arrest and court appearance favoured by such DVC activists as William and Francis Larkin. 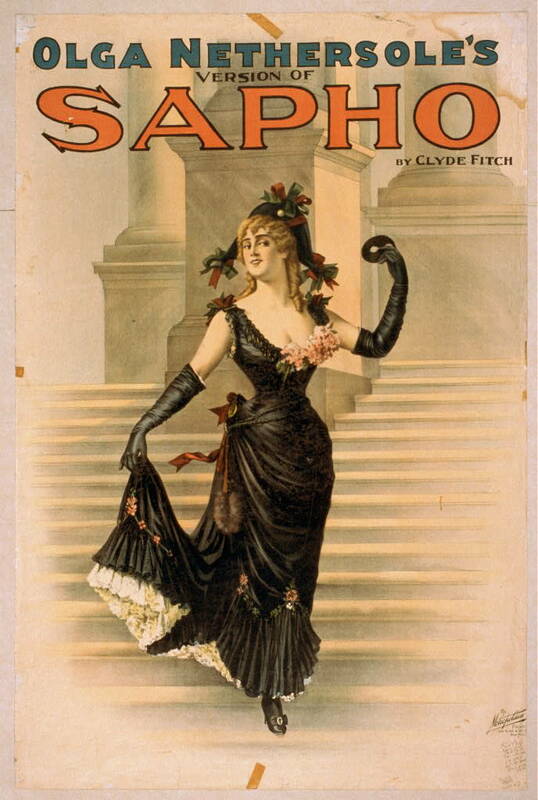 A poster for Olga Nethersole’s theatrical version of Sapho, written by Clyde Fitch. Courtesy of the Library of Congress. 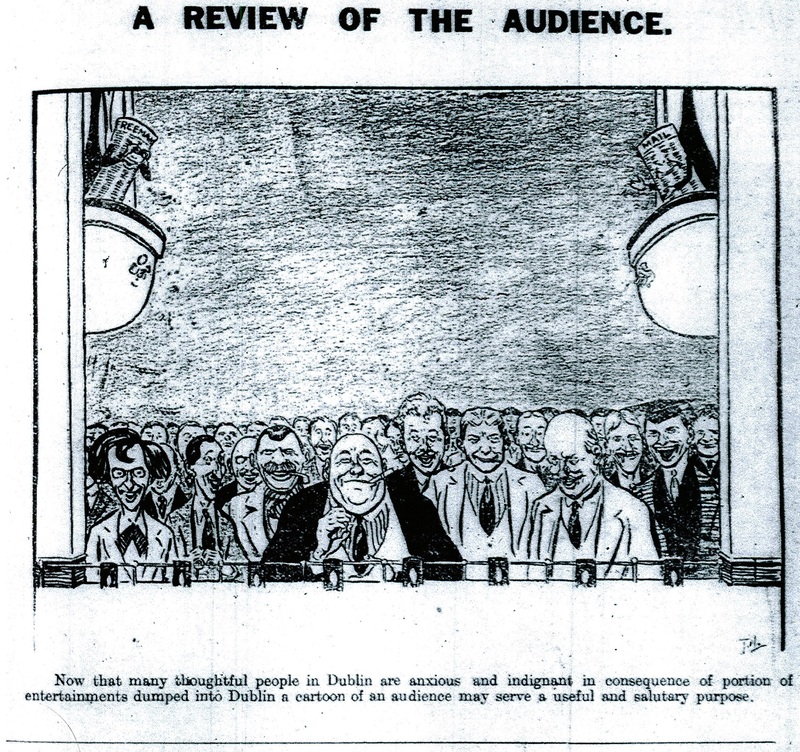 Any experiments against the public taste had long yielded their results, it seems, at least as far as the audience at the Gaiety was concerned. However, cinema had altered Ireland’s mediascape by bringing entertainment out of the city centres to the suburbs, small towns and rural areas, and because it was cheaper than theatre, it was more accessible to the working class. With these shifts in entertainment, the definition of “public taste” and “audience” was up for grabs. Sapho had been one of the key works in Moran’s long-running crusade against the laxity of the mainstream press. And he was right to indicate that theatre and picture-house owners paid to advertise and expected that reviews would at least pay sympathetic attention to their entertainments, if not outright reproduce promotional materials masquerading as criticism. This also makes reviews of limited use for historical purposes. In contrast to this commercial motivation, Moran was – as a self-styled Irish-Irelander interested in Gaelic culture rather than Nationalist politics – hostile to popular entertainments for their Anglicizing influence, which included promoting forms of sexual expression at odds with Irish Catholicism. “A Review of the Audience.” Leader 17 Jul. 1915: 541. Although the picture houses were not yet on Moran’s agenda in July 1915, they soon would be when he supported the DVC coming campaign for film censorship, and the appearance of a well-publicized film adaptation of Sapho would no doubt have put him on the alert. The version of the film shown at the Bohemian in August 1915 was one of two film versions released into the British film market in 1913. When the French company Éclair released its version, starring Nethersole, in Britain in March 1913, it became a cause celebre within the industry. The film was banned in Leeds and other places, and when an exhibitor was prosecuted for showing it in Darlington, the Cinema Exhibitors’ Association took up his defence (“The ‘Sapho’Case”). But it was the US version, released in Britain in November 1913, that would eventually make its way to Ireland. It was made by the Majestic Motion Picture Company and starred Florence Roberts. Whatever its other faults, the adaption to the screen met with approval: “Daudet’s work loses nothing in its production on the cinema, and the large audiences followed the picture through its six parts with interest” (“The Bohemian Picture House”). However, if Irish exhibitors hoped to avoid controversy by waiting nearly two years before booking the film, they miscalculated not so much the public taste as the growing power of the Catholic guardians of morality. “The Bohemian.” Freeman’s Journal 24 Aug. 1915: 2. “The Bohemian Picture House.” Dublin Evening Mail 24 Aug. 1915: 6. “‘Dirty Dublin’ Again.” Leader 10 July 1915: 519-20. “Gaiety Theatre.” Irish Times 20 Sep. 1906: 6. Paddy. “Pictures in Ireland.” Bioscope 9 Sep. 1915: 1176. “The ‘Sapho’Case.” Bioscope 31 Jul. 1913: 349.